Development Horizons by Lawrence Haddad: Future elevated CO2: another reason to cure our "Anemia Amnesia "
Future elevated CO2: another reason to cure our "Anemia Amnesia "
I have written about our collective "Anemia Amnesia" before. Anaemia is the nutrition condition that has high prevalence worldwide and is decreasing at a snails pace (see any Global Nutrition Report). It has serious consequences for cognitive ability, work capability, and greater rate of maternal and child mortality. So it is doubly alarming to read a paper by Smith, Golden and Myers in the latest GeoHealth which concludes that this situation is likely to worsen due to elevated levels of carbon dioxide as we move towards 2050. The paper combines FAO food balance sheet data at the national level, uses the Global Dietary Database to get some granularity on iron availability for 1-5 year olds and women of reproductive age, and then combines this with the 2014 estimates from Myers et al. on the impacts of elevated CO2 on zinc and iron concentrations of key crops. This latest paper answers the "so what?" from the 2014 paper: what impact will these lower concentrations have on potential iron deficiency numbers? The paper labels countries as high, medium and low risk of increased anaemia due to elevated CO2. Countries classified as high risk have levels of anaemia >20% AND modelled loss in dietary iron that would be most severe (over 3.8%). For sure, the estimates of impacts on risk of iron deficiency are built on a series of big assumptions (including on the relevance of elevated CO2 estimates beyond the country the data are from, food group aggregation, the distribution of bioavailability and the changing nature of diets), but they seem reasonable to me. So what do they find? The figure below shows the key result. You can see that South Asia, South-Eastern Africa and North Africa are the most at risk of a potential rise in iron deficiency prevalences. They contain 1.4 billion at risk children 1-5 and women of reproductive ages (not to mention older children and men who also suffer from anemia). Across all countries, the estimated percentages of lost dietary iron under elevated CO2 ranged from modest to more severe: 1.5–5.5%. Estimates for all countries are available in the open access paper. Why are the populations in these countries most at risk? First the populations of these countries have high levels of anaemia and second they consume large amounts of the foods that are most at risk of iron concentration loss due to elevated CO2 (rice, wheat flour, maize and fresh vegetables). 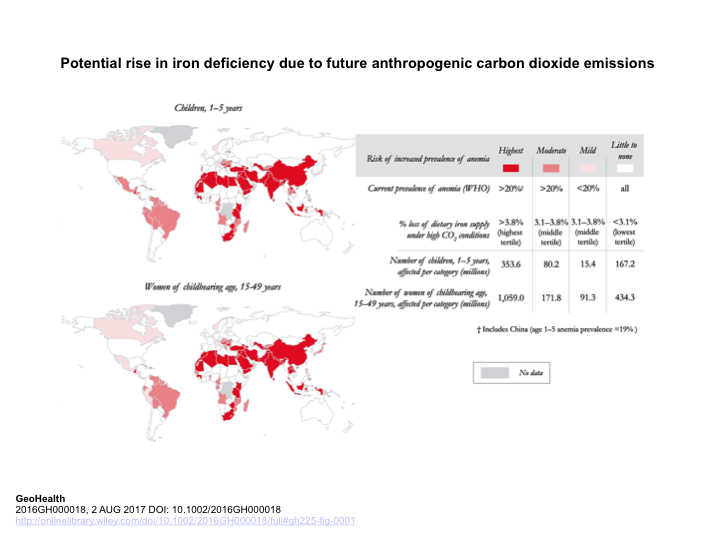 "The potential risk of increased iron deficiency adds greater incentive for mitigating anthropogenic CO2 emissions and highlights the need to address anticipated health impacts via improved health delivery systems, dietary behavioral changes, or agricultural innovation. Because these are effects on content rather than yield, it is unlikely that consumers will perceive this health threat and adapt to it without education." I agree with this. The policy pay off to this work is more on the adaptation than the mitigation side. In other words while this result adds to the case for reducing CO2 emissions, more importantly, I think, it is a real wake up call to the nutrition community. Act now on micronutrient content of the diet because it is not going to get much easier in the future. The two systems that need to become more attuned to this problem are health systems (to address diseases that reduce iron absorption) and food systems (to make iron rich foods more available and affordable). But arguably the most important sentence in the authors' conclusion is the the last one. Unlike food quantity the effects on the nutrition content of foods (whether from elevated CO2, seed varieties selected, storage, transport or processing lose) are hard to detect. So we need more mechanisms for signalling nutrition content of foods in ways that inform the consumer: whether certification, labelling or behaviour change campaigns. Lack of food is relatively easy to observe, but a lack of nutrients is not. Governments and businesses in food systems need to focus more on nutrient content. They will be rewarded with healthier--and wealthier--citizens and consumers. Lawrence, in Africa the arguments may be much more nuanced. It is well-established that high blood iron levels, rich hemoglobin, make individuals more prone to malaria and its consequences. It has been repeatedly found, for example, that providing iron supplements increases individuals' susceptibility to malaria. Indeed, there are strong arguments that sickle-cell anemia is an evolutionary response on the part of African populations to reduce vulnerability to malaria.